Cocoa defeats Lucy The Crusher, after a blatant low blow and then she takes things into the crowd with starting things back up with Sabrina. Nice try with Sabrina’s best knuckleball, but Cocoa show her defensive skills with a well-timed BLOCK. You can bet this will get way more rowdy before it settles back down. You’re welcome. Lucy the Crusher appears courtesy of CALE over at AFW (watch for some NSFW material there) and he provided us with a wonderful alternate shot of Cocoa’s winning hold. Thanks Cale! And to give you a hint into how long I plan things out, I believe Cale sent this over to me six months ago, the middle of December! 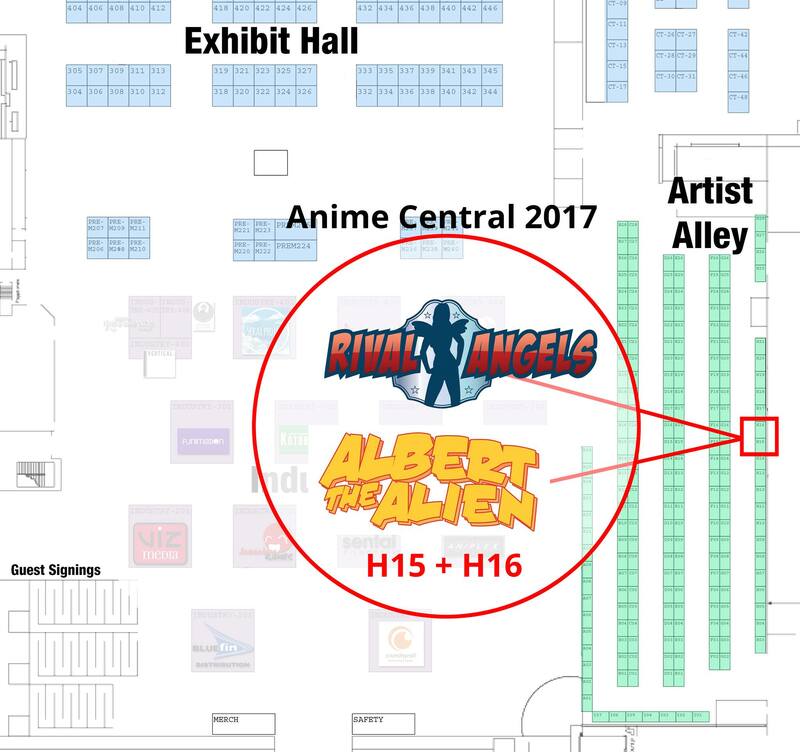 This weekend, Friday May 19-21, I’ll be exhibiting in the Artist Alley of Anime Central, one of the biggest Anime shows in the country. Trevor Mueller and myself will be holed up at tables H15 and H16. We’ll have comics, posters, and commissions for you. If you’re going to be around, be sure to come by and say HELLO. Neat stuff. And if this doesn’t turn into a throwdown, it’ll be because the riot squad didn’t get there fast enough. As you can see, Security is on hand, at the ready, so I’m sure things won’t get out of hand. I feel like Friday’s update will not have Cocoa in nearly as celebratory a mood. Was really hoping Lucy might be able to get the Greco-Roman thumb to the eye…. damn for some reason I thought that was a heenan quote. also del rio’s teddy bear attack on cena was more effective than the possibly empty beverage container assault here. Maybe he said it too? Or even first? Someone better step in before Cocoa tries to start trouble for Sabrina and the others. :(. Security is right there in panel 3, so I’m sure this won’t get very far. I don’t think throwing a cup of buttermilk at Cocoa will do much, try hot coffee next time. WAR! It’s on like a bucket of chicken! They’ve traded slaps, and now thrown beverage! Cocoa may have deflected that drink but standing atop the barricade is a dangerous place to be. Especially since it only takes one good swipe to her legs to send her crashing down like a heap. And Sabrina has a ninja right next to her too. This is a great observation and one you know that Sun has made. She’s got it all mapped out. She still doesn’t get the fact that she’s outnumbered, does she? No one ever said you needed brains to wear a belt, huh? Outnumbered? Cocoa has the three huge muscle heads backing her up. Surely they’re more than enough for the Upstarts? I mean, you have some good points. Reaching a little, but good. Well taken literally, she’s not WRONG…. RC Cola is NOT garbage! I’m glad that interest in Cocoa has stayed strong. 😀 I think every one of the Upstarts would love a crack at Cocoa. Well only booing. So I say Yaay!!! Well done Cocoa: great page. Thumbs up :D! j/k that’s a great panel (1) I love the slight dynamic angle to the panel making the background sort of rise without taking your eye away from the action. I’m thrilled that you liked the panel.I worked hard on it, more than usual because I like both ladies and that the hold in question was for a friend.